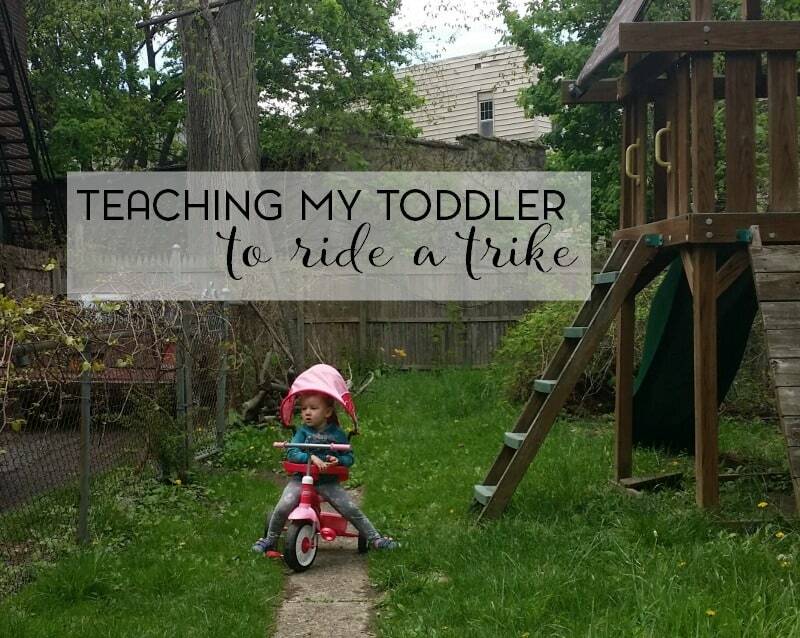 Are you teaching your toddler to ride a tricycle? Before we started, we wanted to find the best toddler tricycle. After that it was a piece of cake (mostly!). A lot changes when children go from being somewhat mobile babies to being sometimes extremely mobile toddlers. At least that was our experience when Squeaker started to transition from barely walking without falling often to running through the house. She’s a curious child, like most children tend to be, and while we have our fair share of moments with her testing the limits or throwing tantrums of epic proportion (over mostly unknown reasons)… toddlerhood, so far, has been fun. It’s been enjoyable to watch the development to this point and I will continue to soak up every single second of the magic of simply being her mom. Most especially on those days that I start to doubt myself. And I will cherish the opportunities that are given to me to make memories with her. Every day presents new opportunities to learn, explore, and appreciate every little thing. From taking a walk through the neighborhood to see the fire trucks, or indulging in Frozen, enjoying ice cream together. Playing with bubbles. Or helping her learn how to ride a tricycle. And as usual, when I attempt to teach her how to do something; I end learning a few valuable lessons as well. Ah yes, that is my sweet Squeaker. I try not to post up too many pictures with her face in them. But, if you follow me on Instagram, on occasion she’ll pop up. Either on her own or with me. I’m not sure what had caught her attention during this particular picture. She’s been fascinated lately with birds, so maybe it was that. Or she was convinced that a fire truck was coming around. And yes, I realize, she doesn’t have a helmet on. We’re working on that as well. Squeaker is not a huge fan. We had received this tricycle sometime ago for review. Right around Squeaker’s first birthday actually, which was in 2014. And with it now being 2016, we’re finally getting more use out of it. 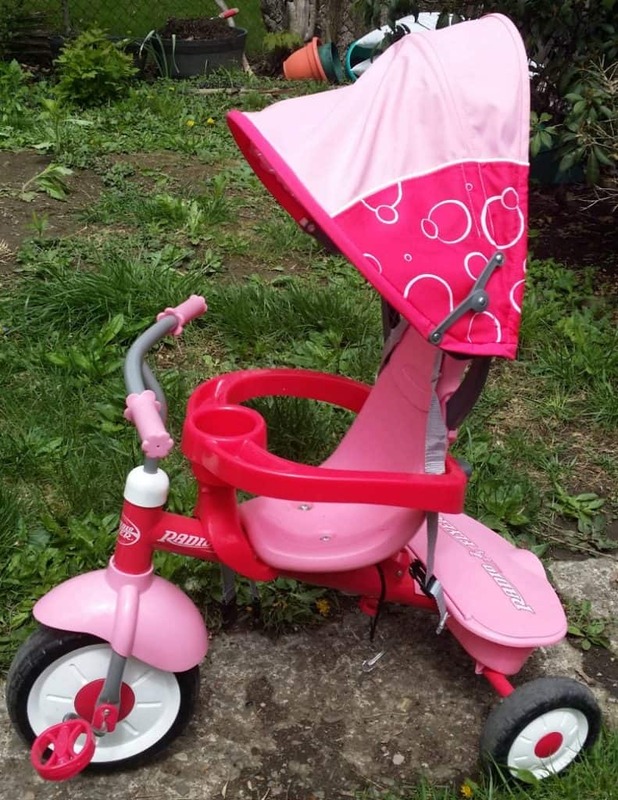 We have a pink version of the 4-in-1 Trike from Radio Flyer. And though they are typically more associated with their wagons, I opted to get the trike instead. Another popular learning trike for this stage, is the Perfect Fit 4-in-1-Trike from Little Tikes. I would love to get Squeaker a Cozy Coupe but at this point, I’m not sure how much more use she’ll get out of it. So we’ll see where that goes. Anyway, back to the trike. Over the weekends, I try to take a break from being online so much. It’s the weekend and I need to make some differentiation between the days. Sometimes it really does feel like everything starts to bleed together. And well, I’d like to be able to spend some time with my family. Sometimes we make plans but most of the time, we take it by ear. T&J are still at the age where birthday parties come into play, and on Sunday I always go to church. Once choir is over, Squeaker will start coming with me to get her more used to being there. And while we might go places sometimes, more often than not we stay local. We’re within walking distance of two parks, driving distance of every other park. Our backyard isn’t huge but it’s big enough. 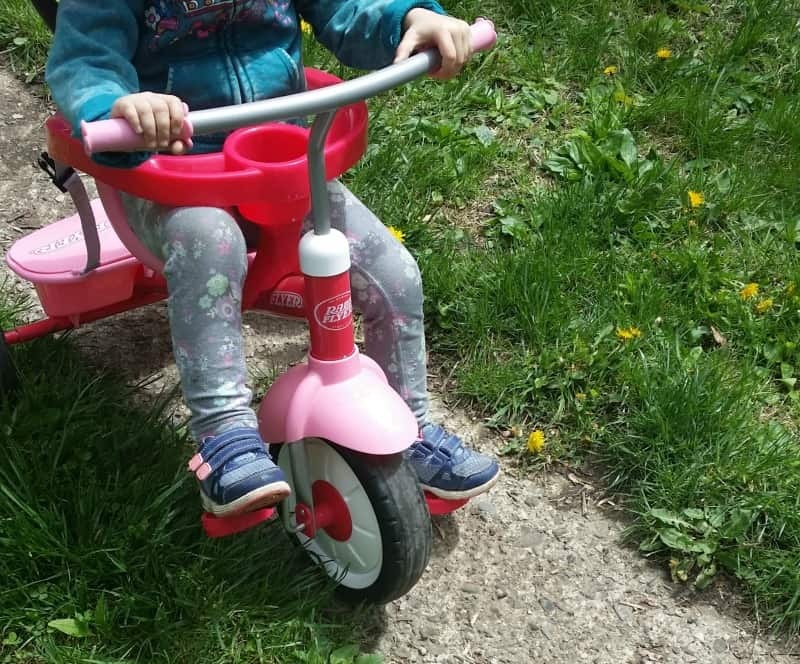 We’re working on getting bikes for everyone to use and, of course, Squeaker has her trike. At first, we had used it more like a stroller for short walks. It wasn’t quite as comfortable as her regular stroller though and because it didn’t recline at all, I was hesitant to take it to the park. But, now that she’s getting a little bit older, she’s showing more interest in actually using it as a trike. At home, I have the steering handlebar off. I’ll help guide her in the right direction, but otherwise, it really is all on her. She’s tall enough that she can reach the pedals and knows enough that she can’t push her feet down at the same time if she wants to get anywhere. So now it’s a matter of helping her understand how to make it go. 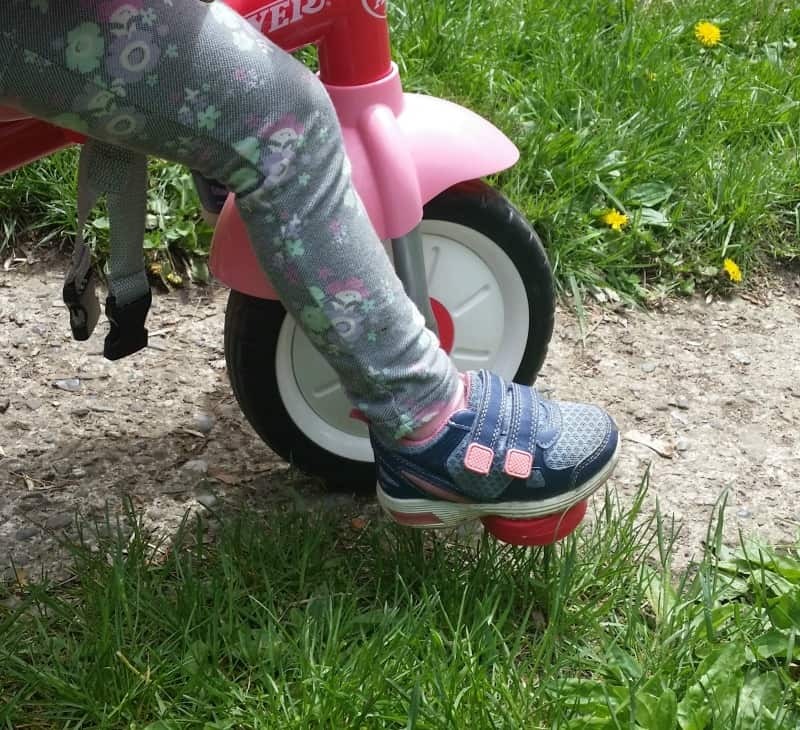 Her preferred method, as of now, is to push forward with one foot (usually her left) and then use that same foot to get the pedals back without moving the trike back. This gets the left pedal back to the height she needs to push forward. And she does quite well getting that forward momentum going. 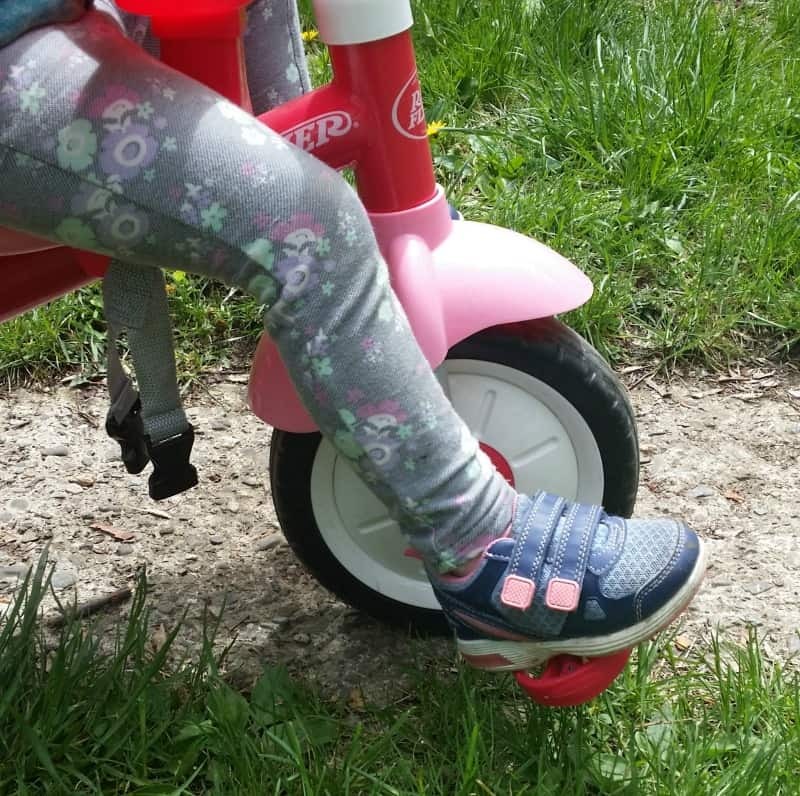 Once she realized that by stepping down/pushing down on the pedal with her foot, she could go forward… and if she extended her leg more, she could go farther. Now, it’s just a matter of helping her realize that if she does the same with her right foot, she’ll have a more smooth motion and get where she wants to go faster. Granted, the backyard is not a completely flat surface so that may have something to do with it. But there is a small parking lot down the street that might be ideal for teaching her. I have a feeling that we’ll be back down at the parking lot many times in the future when she’s learning to ride a bike. Heaven help us all because I am not the most coordinated person out there. This may just be a task for dad. But in the meantime, I’m having fun helping her learn how to ride a trike. I never realized how complex and detailed such a seemingly simple activity could be. It’s also giving me a lot of insight into how much she’s picking up on her own and how well she can (or can’t) understand directions. I wouldn’t expect for her to listen to exactly everything or understand exactly everything 100% of the time. But she is getting there. And in no time, I’m sure, she’ll be riding her trike like a champ. And while she’s learning how to coordinate her limbs, I’m learning to use my words. While she’s learning how to conquer this gross motor activity, I’m learning to have more patience. This is supposed to be fun for her but if I start showing my usual signs of frustration; my empathetic toddler is going to pick up on that quickly. And it will become less of a lesson how to ride a tricycle and more of a “mommy needs a minute” moment.